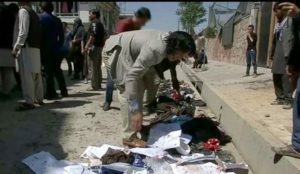 A suicide bomber blew himself up late Wednesday at a crowded park in Iraq’s capital, killing at least seven people in the first such attack in Baghdad since the start a week ago of the holy Muslim month of Ramadan, security officials said. They said police and emergency workers intercepted the bomber as he entered the park in Shoala, a mainly Shiite district in northern Baghdad, but he managed to set off his bomb before being caught. At least 16 people were wounded in the attack, which the officials said could have claimed many more victims if the bomber had gotten himself deeper into the park before blowing himself up…. Baghdad’s parks, outdoor eateries, cafes and commercial areas are usually packed during Ramadan starting shortly after sunset until the small hours of the next day when Muslims eat their last meal before they begin their daily dawn-to-sunset fast…. There was no immediate claim of responsibility for the bombing, which bore the hallmarks of the Islamic State extremist group….